For the beer, see Grimbergen (beer). Grimbergen (Dutch pronunciation: [ˈɣrɪmbɛrɣə(n)] ) is a municipality in the Belgian province of Flemish Brabant, 10 km north of the capital Brussels. It comprises the towns of Beigem, Grimbergen, Humbeek and Strombeek-Bever. In 2017, it had a population of 37,030 and an area of 38.61 km2, giving a population density of 959 inhabitants per km2. Grimbergen is in the Dutch language area of Belgium. The French-speaking minority is represented by four members on the 30-seat local council. Grimbergen is mostly known for its Norbertine abbey and the beer once brewed there. Grimbergen's proximity to Brussels makes it a residential town for commuting. Grimbergen Abbey is a Premonstratensian monastery in Grimbergen, Flemish Brabant, Belgium, established in 1128 in the place of an earlier foundation of Augustinian Canons. Grimbergen is the brand name of a variety of Belgian abbey beers. Originally made by Norbertine monks in the Belgian town of Grimbergen, it is now brewed by two different breweries in Belgium and France. In Roman times, several important roads passed near the territory of present Grimbergen. A fort was built in the 8th century at the strategic point where the road crossed the river Zenne. The local lord soon acquired a large piece of territory in this area, extending to the rivers Scheldt, Rupel, and Dender. The Zenne or Senne is a small river that flows through Brussels, left tributary of the Dijle/Dyle. In the 12th century the name of the hamlet was Grentberghis, which came from the Old Dutch Grientbergen, meaning mounds of coarse sand. A community of Augustinian monks had already tried to settle here a century earlier during the reign of Godfrey III, Duke of Lower Lorraine, but it is only in the early 12th century that their religious community prospered. Under the leadership of Norbert of Xanten, the Norbertine monks built the Grimbergen Abbey here in 1128, founding a beer brewery. A few years later, the animosity between the powerful Grimbergen family and their then infant overlord Godfrey III of Leuven precipitated the Wars of Grimbergen. The unrest caused the destruction of the local castle by the Duke of Brabant, the move of the ruling Grimbergen lord to nearby Ninove, and the parceling of his territory. The city's coat of arms dates from that period. Godfrey III, called the Bearded, was the eldest son of Gothelo I, Duke of Upper and Lower Lorraine. By inheritance, he was Count of Verdun and he became Margrave of Antwerp as a vassal of the Duke of Lower Lorraine. The Holy Roman Emperor Henry III authorized him to succeed his father as Duke of Upper Lorraine in 1044, but refused him the ducal title in Lower Lorraine, for he feared the power of a united duchy. Instead Henry threatened to appoint a younger son, Gothelo, as Duke in Lower Lorraine. At a much later date, Godfrey became Duke of Lower Lorraine, but he had lost the upper duchy by that point in time. Saint Norbert of Xanten (Xanten-Magdeburg), also known as Norbert Gennep, was a bishop of the Catholic Church, founder of the Premonstratensian order of canons regular, and is venerated as a saint. At the beginning of the 14th century, half of the territory became part of the estate of the House of Nassau. 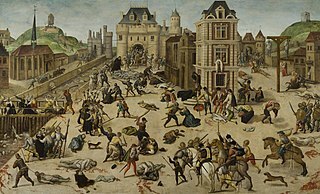 Like everywhere else in Flanders, the Wars of Religion of the end of the 16th century caused widespread destruction. In 1752, Anne, Princess Royal and Princess of Orange, who had received the land from her consort William IV, Prince of Orange-Nassau, ceded the barony to the Prince of Berghes, who owned the other half, thereby reuniting the original land of Grimbergen as a single, but short-lived, princedom. The feudal regime and the power of the lords came to an abrupt end under the French Regime in 1794. The clerical powers of the abbey were abrogated a couple of year later until a few years after the Belgian Revolution of 1830. Up until then, the town's character was mostly rural and agricultural. In the middle of the 19th century, the new road linking Vilvoorde to Aalst and the Brussels-Willebroek canal started attracting industrial concerns. The vicinal tramway arrived in 1887 and a local airfield was built after World War I. The majestic church of the Grimbergen Abbey, dedicated to Saint Servatius, patron saint of the city, was rebuilt several times since its foundation in 1128. The current construction dates from 1660 and ranks among the most harmonious Baroque buildings in Belgium. The tower houses a 49-bell carillon. The houses lining the central square in front of the church have also been rebuilt in the original style of the 18th century. In 1999, the church of Grimbergen has been given the title of basilica. The Grimbergen beer museum is located next door and gives its visitors an opportunity to taste the famous local brew. The oldest astronomical public observatory in the country is located in the former farm dependencies of the abbey. Grimbergen is particularly rich in castles, counting four of them on its territory, including the beautiful 17th century Renaissance-style Guldendal, and the ruins of the lords of Grimbergen's old keep now named the Prinsenkasteel. It also counts several farms dating from the 17th century as well as two medieval water mills. The main annual event is the Sint-Servaasommegang, loosely translated as procession of Saint Servatius. It dates from 1280 and takes place on the Saint's birthday, May 13, or on the first following Sunday. A well-attended kermesse takes place on the first Sunday of September. A nativity scene is organized in the abbey church around Christmas. The main football club used to be K.F.C. Strombeek, but is now named F.C. Molenbeek Brussels Strombeek and located in neighboring Sint-Jans-Molenbeek. Since 2015 Grimbergen has its own field hockey club named Merode Hockey Grimbergen. After only tree years they got enough funding together to build a state of the art hockey field. Starting from January 2019 the club will be playing their own field at the Populierendallaan 111. Anderlecht is one of the 19 municipalities of the Brussels-Capital Region. Located in the southwest of the city, it is bordered by the City of Brussels, Dilbeek, Forest, Molenbeek-Saint-Jean, Saint-Gilles and Sint-Pieters-Leeuw. In common with all of Brussels' municipalities, it is legally bilingual (French–Dutch). Dilbeek is a municipality in the province of Flemish Brabant, in Flanders, one of the three regions of Belgium. The municipality comprises the villages of Dilbeek proper, Groot-Bijgaarden, Itterbeek, Schepdaal, Sint-Martens-Bodegem, and Sint-Ulriks-Kapelle. Dilbeek is located just outside the Brussels-Capital Region, in the Pajottenland, hence the local name Poort van het Pajottenland. Even though Dilbeek is located in the Dutch language area of Belgium, there is a French-speaking minority represented by 4 members on the 33-seat local council. It is a mostly residential community with largely preserved rural areas and some industrial zones. 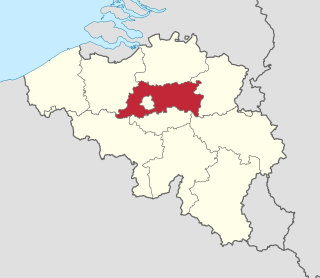 Sint-Pieters-Leeuw is a Dutch-speaking municipality of Belgium located in the province of Flemish Brabant. 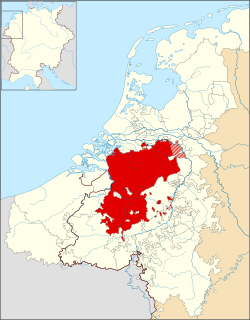 Wemmel[ˈʋɛməl](listen) is a municipality located in the Belgian province of Flemish Brabant. The municipality only comprises the town of Wemmel proper. On January 1, 2006, Wemmel had a total population of 14,774. The total area is 8.74 km² which gives a population density of 1,690 inhabitants per km². Zaventem is a Belgian municipality in the province of Flemish Brabant. It is located in the Dijleland area, one of the three large recreational areas which together form the Groene Gordel around the Brussels-Capital Region. The municipality comprises the subdivisions or deelgemeenten of Nossegem, Sint-Stevens-Woluwe, Sterrebeek and Zaventem proper. On 1 January 2006 Zaventem had a total population of 28,651. The total area is 27.62 square kilometres, which gives a population density of 1,037 inhabitants per km². The official language is Dutch as it is within the Flemish Region. Zaventem is the home of Brussels Airport, together with neighbouring town of Diegem. Diest is a city and municipality located in the Belgian province of Flemish Brabant. Situated in the northeast of the Hageland region, Diest neighbours the provinces of Antwerp to its North, and Limburg to the East and is situated around 60 km from Brussels. 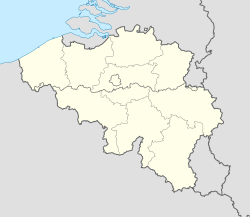 The municipality comprises the city of Diest proper and the towns of Deurne, Kaggevinne, Molenstede, Schaffen and Webbekom. As of January 1, 2006, Diest had a total population of 22,845. The total area is 58.20 km² which gives a population density of 393 inhabitants per km². Halle is a city and municipality of Belgium, in the district (arrondissement) Halle-Vilvoorde of the province Flemish Brabant. It is located on the Brussels-Charleroi Canal and on the Flemish side of the language border that separates Flanders and Wallonia. Halle lies on the border between the Flemish plains to the North and the undulating Brabant lands to the South. The city also borders on the Pajottenland to the west. The official language of Halle is Dutch. Nivelles is a Walloon city and municipality located in the Belgian province of Walloon Brabant. The Nivelles municipality includes the old communes of Baulers, Bornival, Thines, and Monstreux. Schaerbeek or Schaarbeek is one of the nineteen municipalities located in the Brussels-Capital Region of Belgium. It is bordered by the City of Brussels, Etterbeek, Evere and Saint-Josse-ten-Noode. In common with all the Brussels municipalities, it is legally bilingual (French–Dutch). The Dyle, is a river in central Belgium, left tributary of the Rupel. It is 86 kilometres (53 mi) long. It flows through the Belgian provinces of Walloon Brabant, Flemish Brabant and Antwerp. Its source is in Houtain-le-Val, near Nivelles in Walloon Brabant. RWDM Brussels FC, often simply referred to as FC Brussels or simply Brussels was a Belgian association football club based in the municipality of Molenbeek-Saint-Jean in the Brussels Capital-Region. They last played in the second division during the 2013–14 season where they finished 8th, but folded at the end of the season due to financial trouble. The club was a continuation of FC Strombeek, a club from the Brussels suburb of Strombeek-Bever with matricule n°1936 which was formed in 1932. FC Brussels played at the Stade Edmond Machtens, Molenbeek's former stadium. Their highest league ranking was a 10th place in the first division in 2005–06. R.W.D. Molenbeek, short for Racing White Daring Molenbeek, was a Belgian football club founded in 1909 as White Star Club de Bruxelles. It then became a member of the Belgian Football Association later the same year as White Star Athletic Club and received the registration number 47. Saint Servatius was bishop of Tongeren —Latin: Atuatuca Tungrorum, the capital of the Tungri—. Servatius is patron saint of the city of Maastricht and the towns of Schijndel and Grimbergen. He is one of the Ice Saints. His feast day is May 13. Mosan art is a regional style of art from the valley of the Meuse in present-day Belgium, the Netherlands, and Germany. Although in a broader sense the term applies to art from this region from all periods, it generally refers to Romanesque art, with Mosan Romanesque architecture, stone carving, metalwork, enamelling and manuscript illumination reaching a high level of development during the 11th, 12th and 13th centuries. The Brussels Ring numbered R0, is a ring road surrounding the city of Brussels as well as other smaller towns south of Brussels. It is about 75 kilometres (47 mi) long, with 2 or 3 lanes in each direction. While most of it is classified as a motorway (highway), part of it is merely an express route. It crosses the 3 regions of Belgium: its main part is situated in Flanders, whereas Wallonia comprises 18.2 kilometres (11.3 mi) of the total stretch and 5.5 kilometres (3.4 mi) is on Brussels territory. Woluwe-Saint-Lambert or Sint-Lambrechts-Woluwe is one of the nineteen municipalities in the Brussels-Capital Region of Belgium. It is a prosperous residential area, with a mixture of flats and detached, semi-detached and terraced houses, often compared with Uccle, another affluent Brussels municipality, and the 14th or 17th arrondissement in Paris. The Archdiocese of Mechelen-Brussels is an archdiocese of the Roman Catholic Church in Belgium. It is the Primatial See of Belgium and the centre of the Ecclesiastical Province governed by the Archbishop of Mechelen-Brussels, which covers the whole of Belgium. It was formed in 1559 and the bishop has a seat in two cathedrals, St. Rumbold's Cathedral in Mechelen and the Cathedral of St. Michael and St. Gudula in Brussels. The current Archbishop is Jozef De Kesel, who was installed in November 2015. Wikimedia Commons has media related to Grimbergen .